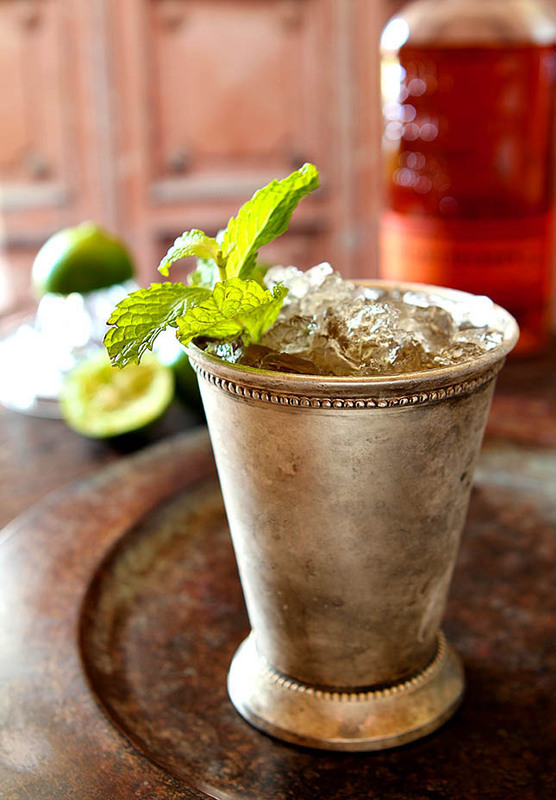 Most everyone is aware that there is a signature drink for the Kentucky Derby; but all the races actually have one. 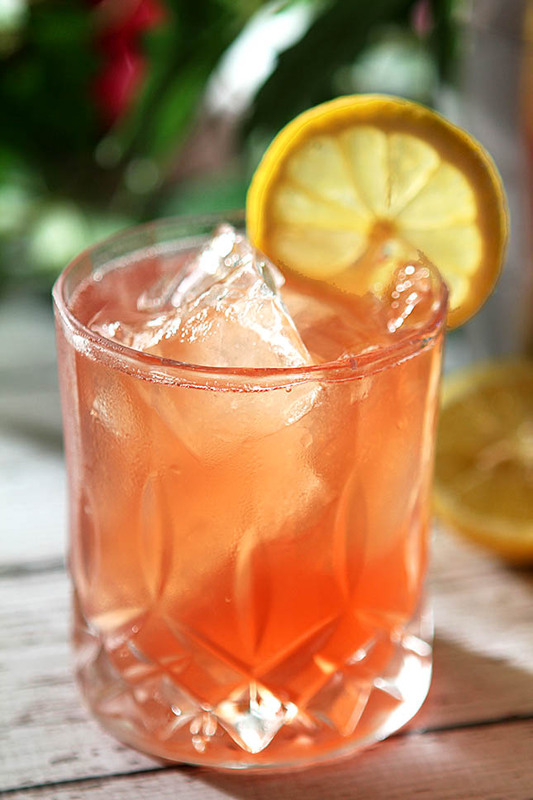 The Belmont Jewel Cocktail for the Belmont Stakes is a combination of bourbon, lemon juice, pomegranate juice, and simple syrup. Easy and delicious all summer long! When I was a young woman and living on my own in an apartment, one of the guys in my building became my pal. We were a most unlikely pair but it was definitely a case of opposites attracting. Me; responsible, serious, hard working. Him; flighty, self-indulgent and seemingly without a job. But then I found he had a job. He bet on the horses. While I drove to an office for an 8-5 job he spent his days lounging by the pool, going to the track and a big part of his time was spent pouring over data to help him determine his next big win. I went to the track with him once, bet $2 on a horse he recommended and lost. I was crushed. I’m not sure what that $2 would equate to today; maybe $20…but that was it for me. I found other ways to pick a winner even though I’ve never bet on another horse. This season? Picking a horse for The Derby was easy. I had a couple of friends over for the shortest parties in existence. Show up for the race a couple of minutes ahead of time, grab a cocktail (Muscavado and Vanilla Bean Mint Julep), watch the race and leave to go back to cutting the grass or washing the car. No one had a favorite but still, we all got into the race from the starting gate and ‘my’ horse was easy to pick. Poor thing. Started in an outside gate and had to move quite a distance to the inside but he held his own. He stayed close to the lead and we all decided this horse was our hero; the little engine that could. As the race came to a close and the leader stayed his ground it looked close but it was between the leader and ‘our’ horse and son of a gun; the horse whose name I had not known before the race took the win. American Pharoah. I found out later he was a favorite but he was also fighting tradition. Starting in position 18, one horse scratched so he moved to number 17. No horse had ever won the derby from position 17. This was destiny! Heading into the Preakness I continued with my short party tradition and my offering of the race’s signature cocktail. Not as well known as the Mint Julep, the Preakness also has a signature cocktail called The Black-Eyed Susan so of course I had those made, everyone grabbed their cocktail and that race looked too easy when our boy won handily. So now it’s time for the third leg of the Triple Crown; some might think that a series of races but I might think of it more as a series of cocktails! The Belmont Jewel Cocktail for the Belmont Stakes is hardly that. Talk about an identity crisis…this one has that certainly. Not like the Julep and the Derby, this race has seen different cocktails come and go. Until 1997 the White Carnation was the signature cocktail; it was replaced by the Belmont Breeze, a complicated drink created by famed mixologist Dale DeGroff. Though popular for several years, the folks in charge decided a less complicated and easier to prepare drink would be more fitting; they do make tens of thousands of them each race day. Happy that I only make a handful I was still very pleased that I didn’t have to buy a bottle of Harvey’s Bristol Cream Sherry; I have enough stock on hand that bottles used for only one cocktail seldom fit into my game plan. Enter the Belmont Jewel. I’ll tell you, this baby is bourbon forward. I like bourbon but sometimes, and this was the case here, I think it could use some toning down. So I’ve added a bit of sparkling soda. Not only to temper the bourbon a bit, but hey who doesn’t like a bit of fizz, right? While the original recipe calls for lemonade, I thought it silly to make a pitcher of lemonade to try this one cocktail and have substituted with lemon juice and simple syrup. Drinks for a crowd? Then go ahead and use lemonade in place of both the lemon juice and syrup. I liked this cocktail. I think the name is befitting the third jewel in the Triple Crown and the ease of preparation speaks more to my party planner ideas. Nearby on Saturday at 4:15pm? Come on over for a party. We’ll be done by 4:30; let’s hope we can hoop and holler just a bit when my new favorite horse wins the whole doggone thing. Cheers! 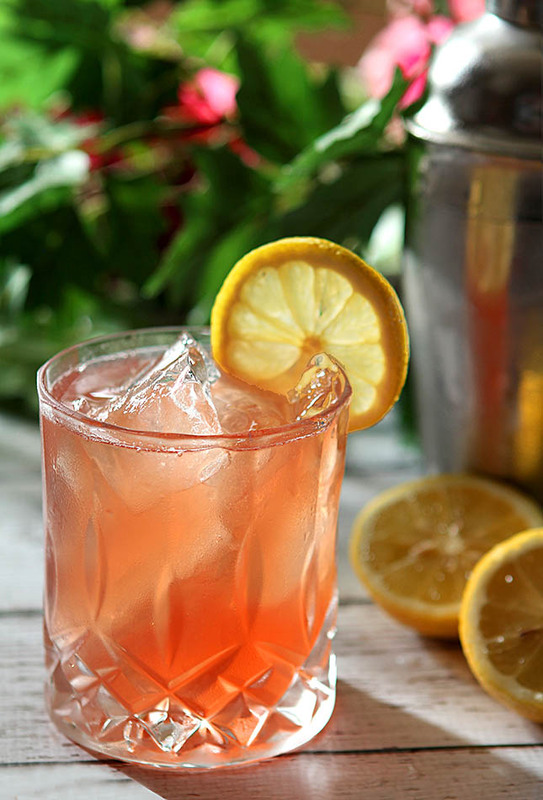 Combine bourbon, lemon juice, simple syrup and pomegranate juice in a cocktail shaker and fill shaker with ice. Fill a lowball glass with ice, pour mixture over ice and top with sparkling water. Stir. 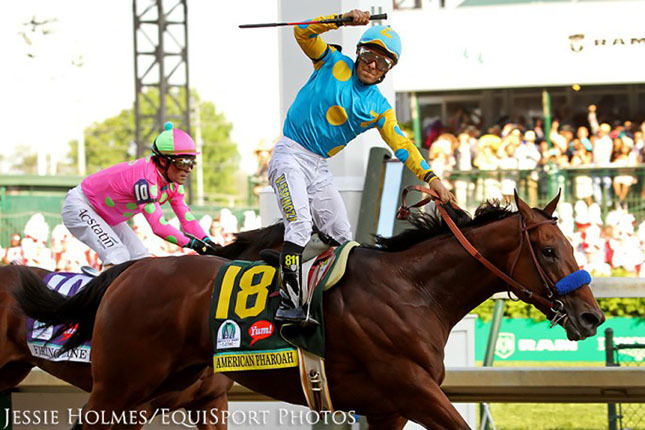 Root for American Pharoah. ? Did you know that Belmont Park has a long forgotten signature drink? I did not know this story but next year I might have to tell it. Thanks! I have a bottle of Harveys on hand at all times. I was introduced to it when I was 18 and loved it ever since. (Booze was legal for 18 years olds back then) However, THIS looks amazing. And wonderful. And I’d like some… now. I don’t watch horse races but I’d love to sip on this beauty! Pomegranate juice in cocktails is one of my favorites! I’m always looking for new summer cocktails and this one sounds like a winner! I love that is has Pom juice in it! What a beautiful photo and pretty colored drink with that sunlight filtering through it! Your concoction sounds so refreshing and perfectly befitting the triple crown. I didn’t watch one race in the triple crown this year. Usually I happen to see them on Australian TV on weird channels but this year I totally forgot. I’ll make one of your Belmont Jewels and make up for it. I love how it looks. You captured a gorgeous photo of this summery drink. It seems to fit the occasion perfectly and I’m sure it will be a hit at your viewing party. We’ll be watching at our house too as long as I remember what time the race starts. Thanks for the heads-up! We were pretty happy with the results…both the drink and American Pharoah’s win…exciting to see a Triple Crown race; they don’t happen often that’s for sure. You’re right John it is sorta kinda and once again I have swayed a non bourbon lover over to the wonder of a good bourbon cocktail. Every time I serve a bourbon drink someone says, ‘Oh I don’t like bourbon’ and I think they had to have had a cocktail where someone had a heavy handed pour. It was wonderful with the lemon and pomegranate!